In football, if one guy isn’t all in, nobody succeeds. Every other guy may be fulfilling their role, but it doesn’t matter. Whether you are the star quarterback or on the sideline, farthest from midfield, you have a responsibility to your team and owe it respect. That’s teamwork in a nutshell. And, it goes beyond football. Teamwork is life. You can’t go a day without interacting with — and influencing — other people. Especially now, with the sharp rise in our use of technology. Being a “good teammate” might sound simple. You might say, “I’ll just hide behind a keyboard or throw a fake smile on my face and nobody will know the difference.” But it’s more than that. To be successful, you have to be a true team player, something that my teammates and I heard every day in the fall of 2017 as members of the Fayetteville-Manlius High School football team. Our coaches embraced our team culture just as much as they embraced winning — and expected us to do the same. We were told that we had a lot of potential, but wouldn’t reach it unless we valued one another and formed “bulletproof” bonds. We took that mindset with us throughout the season, which was plagued by injuries that prevented us from getting by the sectional quarterfinals. However, we grew as individuals and as a team. And, my teammates told me that they thought about forming those bonds in relation to me. What made that even more powerful is that I only knew a few of them before the season. So there I was, this kid who everybody had seen in the hallways and heard whispers about, joining the football team and offering to write about the games. Once I made it obvious that being in a wheelchair wasn’t going to define me, my teammates followed, and then so did everyone else. Whether it was by texting in the group chat, driving up and down the sidelines during games, or writing about the highs and lows of the season, I forced everybody to open their minds and look beyond my mode of transportation. I quickly built relationships with my fellow players and the coaches, whether it was by writing the preseason articles, constantly texting with the guys in the group chat, or simply talking with our coaches so we could get to know one another. Though it was difficult and awkward at first, it grew easier and our bonds solidified. 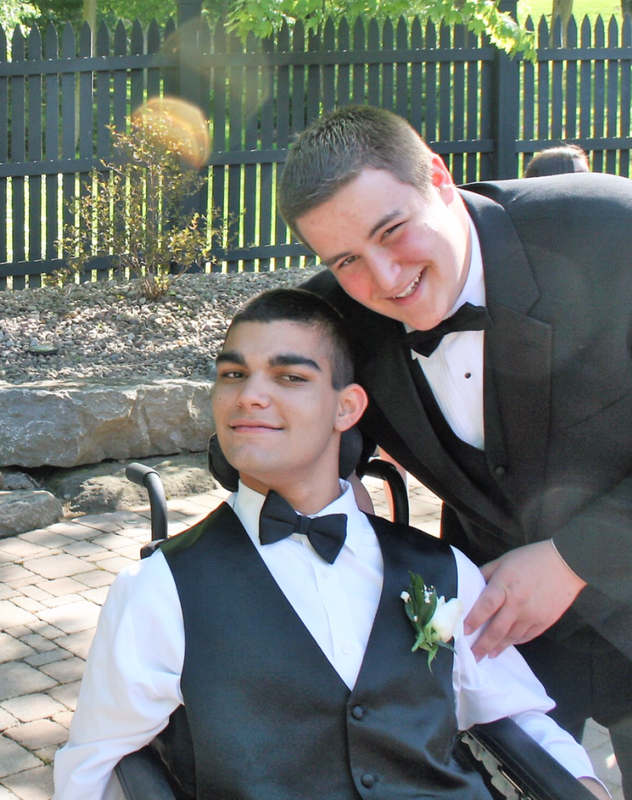 Eventually, I was “just Joe,” as one of my teammates, Andrew Testani, who I have been best friends with since elementary school, phrased it in an interview with Spectrum News. Whether I had known them since fourth grade or we were just getting to know one another, they valued who I was, not what I was. They found ways to let me know how I inspired them. Many of the guys who didn’t know me told me that I forced them to be more open-minded and accepting. And, although I appreciated their words, that’s not the message I want to send. I don’t want to force anybody to be anything. I just want people to realize that disabilities don’t define who a person is. And, my teammates understand this. When it comes down to it, I know these are the ones I can call friends. With Testani, Mikey Porter, and other teammates who I have grown closer with, there’s no judgment. No sympathy. No barriers. None of that. If I need help, they help me, but other than that, I am just another one of their friends. In learning about The Positivity Project (P2) last year at my high school, I realized that my experiences on the football team are closely aligned with the P2’s Other People Matter Mindset. 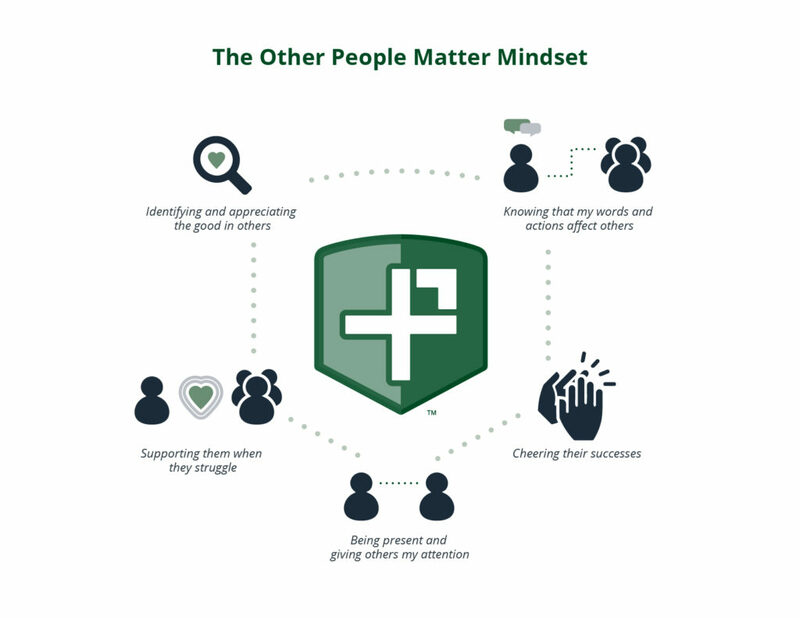 The Other People Matter Mindset provides people with a deeper understanding of what it looks like and sounds like to live with the belief that Other People Matter. It consists of identifying and appreciating the good in others, knowing that my words and actions affect others, supporting people when they struggle, cheering others’ successes, and being present and giving others my attention. I believe that each of these elements is very important — and tenets that everyone should strive to live by. 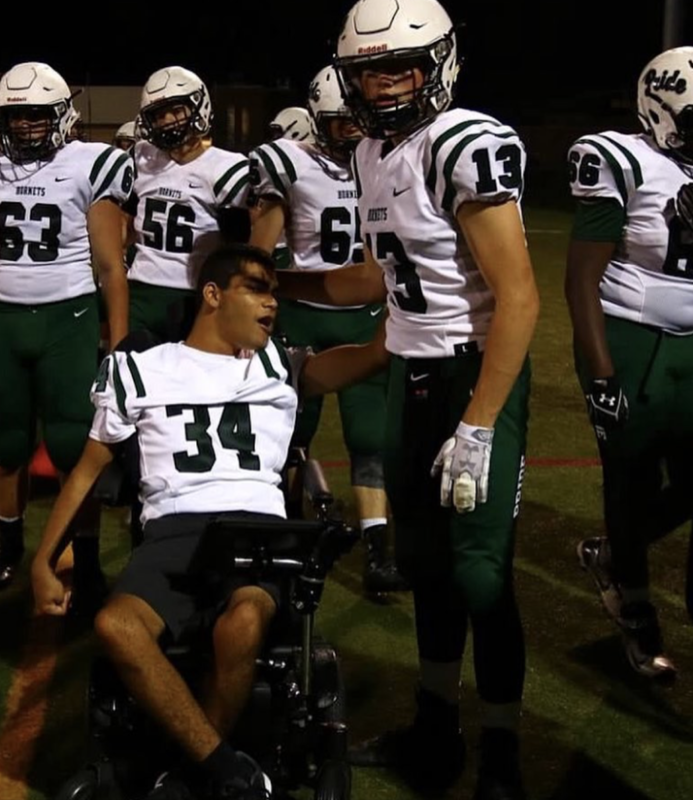 However, I’d like to specifically focus on one element that I personally experienced on the football team: supporting people when they struggle. When it came time for everyone to retrieve their equipment for the season, we all headed up to PRIDE Hill for an important tradition: placing PRIDE stickers on our teammates’ helmets. This is the slope that defines, not only the football program, but the entire school. It’s a big moment. As the captains were decorating each helmet, I wondered if — and how — I would be a part of that tradition. Eventually, I figured that I wasn’t going to get one because I didn’t have a helmet. And, I felt fine with that. But, I was wrong to make assumptions. When every helmet was full of PRIDE, my teammates greeted me at the bottom of PRIDE Hill. They gave me a box with jerseys, sweatpants, a jacket, and the sticker. They pulled the sticker out of the box, and then placed it on the left side of the chair frame, directly above the drive wheel. It’s a memory that will always be valuable to me, regardless of what chair I use to navigate. It was the defining moment of the season for me. Not because I was the center of attention, which is the opposite of what I want, but because my teammates didn’t forget about me despite the excitement of the new season. And, although that moment meant a lot to me, my coaches and teammates didn’t see why. They always reminded me that I was just another guy and treated me like that. From squirting water and hydrating me to refusing to break a team huddle until I was there, I was never any different than them. Our culture, such a focal point of our team, was on-point with the Other People Matter Mindset. Why? Because that mindset is what teamwork — and life — is all about. And living in that manner makes us all better and stronger people.